THE WEATHER HAS been calmer this week, but many areas are still feeling the effects of last week’s storm with clean-up operations ongoing in some areas. 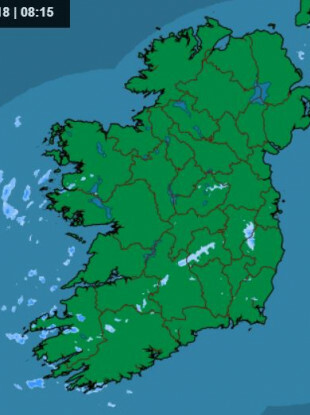 Today will be cold and frosty to start, with some icy roads, Met Éireann has said. There will be sunny spells and showers – some will be heavy this morning and fall as sleet, mainly on high ground. It’ll be less showery later this afternoon. Top temperatures will range from seven to nine degrees Celsius, with moderate north to northwest breezes. It’s expected to be very cold tonight with a widespread hard frost and some icy roads. Mist will thicken into fog in places also, and temperatures will dip to minus three in some places. Frost, ice and fog will clear to a dry, bright and fairly sunny morning tomorrow. Met Éireann says rain will develop along southern coasts in the afternoon and extend through Munster and much of Leinster in the evening, giving some heavy and possibly thundery rainfall. Top temperatures will range from seven to nine degrees. It’ll be cold early tomorrow night in Ulster, with some frost and temperatures close to zero. Persistent and heavy rain over Leinster and Munster will become widespread, preceded by some sleet over Ulster. Temperatures will rise to five to eight degrees in the other provinces by dawn. Easterly winds will be fresh and gusty. Snow will keep melting on hills and mountains, especially in Leinster. Saturday will be cold in Ulster, with highs of six to eight degrees. It’ll be milder elsewhere, with temperatures of 10 to 12 degrees. Rain or sleet over Ulster will clear gradually. It’ll be a brighter day elsewhere, with occasional showers and a few sunny spells. Fresh and gusty easterly winds are expected at first, but these will become southeast to southerly in the afternoon and evening. It’s expected to be misty overnight, with patches of drizzle and fog in places. Sunday is due to be mostly dry and bright, with a mix of cloud and sunny spells. It’s expected to be dry apart from some showery rain developing along the south coast. Top temperatures will range from eight to 11 Celsius. It will be misty and cloudy along the south and east coasts overnight, with some rain. However, it’ll be drier elsewhere with some clear spells. Email “Sunny spells and showers - here's what the weather will be like this weekend ”. Feedback on “Sunny spells and showers - here's what the weather will be like this weekend ”.